A Comedy of Epic Proportions. An outrageous odyssey of fun, fantasy, and adventure unfolds in the hilarious hit film Hercules - Disney's 35th animated triumph "brimming with comic surprise!" Taken from the gods as a newborn and adopted on Earth, Hercules becomes an awkward teenage pillar of strength. Trying to fit in, he discovers Zeus is his dad and his home is on Mount Olympus - if he can move from "zero" to true hero! Hercules teams with babyhood pal Pegasus, the flying stallion, and Phil - a feisty personal trainer - for the mission. But it's no walk on the Acropolis. He must match wits with Grecian beauty Meg and a comical hothead named Hades, who's having a devil of a time with his hostile takeover of the universe. Hades is armed with morphing morons Pain and Panic for help, and only Hercules stands in his way! $21.454 million on 2872 screens. How quickly things change in the movie business! For the five years from 1989 through 1994, Disney's animation studios experienced greater and greater success, starting with the creative and commercial rebirth borne by The Little Mermaid. 1990 displayed a brief return to mediocrity with the forgettable Rescuers Down Under, but 1991's Beauty and the Beast not only made even more money than Mermaid but it also marked the first - and still only - time that an animated film received an Oscar nomination for Best Picture. 1992 produced megahit Aladdin, and after a 1993 without a traditional animated film, Disney achieved their all-time greatest financial success with The Lion King, the year's biggest hit. (Yeah, Forrest Gump made more money, but King sold more admissions since so many more of its tickets were sold for matinees and also at discount rates for kids). Fortunes began to reverse themselves the following year when Pocahontas failed to create much of a spark. 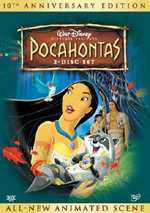 Oh, it still made a lot of money, but King raised the stakes, and Pocahontas couldn't live up to the new expectations. Later that year, the studio hit paydirt with Toy Story - ultimately the year's most successful film – but that movie represented no victory for the animation studio, since it was a computer-generated affair produced by Pixar, not by Disney's own people. 1996 saw further decline with the relative failure of The Hunchback of Notre Dame, but that one was more of a tough sell. It was a fairly dark film and it lacked much of the broad appeal of some of the other films. All at Disney banked on a return to form with 1997's Hercules. No darkness or serious drama here; that film would openly attempt to recapture the fun, hyperactive spirit of Aladdin by keeping things light and funny. A huge ad campaign and tie-ins at many spots such as McDonald's made sure the Hercules name would be right up front through the summer of 1997 and would guarantee huge revenues. Alas, it was not to be. Hercules failed to strike a chord with the summer's audiences, and it ended up a near-flop. It pulled in almost $100 million, which might be great for Antz or Prince of Egypt but was an enormous disappointment for Disney's summer blockbuster. Disney took their hits and went back to the drawing board, in a fashion. 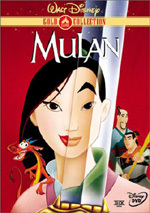 The following summer's Mulan lacked the omnipresent promotional profile of Hercules. Although its $120 million doesn't seem like much compared to that of its predecessor, it's all in the buzz and the spin, so its lowered expectations allowed it to come across as a much bigger success. When I first saw Hercules during its theatrical run, I fully agreed with all the critics who panned it and declared it a triumph of style over substance. It was hard to take such an eagerly commercial effort so soon after the satisfying darkness of Hunchback, and it seemed like such a forced attempt to counteract the slump. The movie didn't feel like it existed for any reason other than to plop young butts in the seats and sell some action figures. Since then, I've changed my tune. No, I don't think Hercules compares to the best Disney offerings, but I now find it to be a much more satisfying and enjoyable film. It doesn't take any of the ancient legends on which it's based seriously, and its wild sense of humor keeps me entertained and sporadically amused. Once you adjust to the hyperactive pacing, you can find it witty and clever. This is certainly a movie that packs in more little gags than most, so it stands up nicely to additional screenings. Although it ostensibly comes based on Greek mythology, most of the story really rips off the first two Superman movies. From Herc's farmer parents to his departure to discover his past to the way he sacrifices his power or the manner in which he refuses to accept the death of his honey, it's all straight out of those movies. That's not necessarily a bad thing, though the parallels are too close for my liking; a bit more originality would have worked better. One other aspect of the movie that causes some problems is its melding of cel-based and computer animation. In terms of 1997 technology, I find that a combination of traditional animation and CGI looks bizarre and disconnected. I had that problem with the many computer-animated portions of The Prince of Egypt because they disrupted whatever spell the film had established. The CGI looked incongruous and, though it was of decent quality, the dissimilar nature of the images distracted from the story. The CGI in Hercules doesn't seem quite as disruptive, but I still don't care for it. We find computer animation in sources like the multi-headed hydra or aspects of the environment in Olympus. For example, when baby Herc tosses a thunderbolt that busts part of a building, CGI renderings show it as it regenerates. All of this seems self-consciously showy to me. It falls into the category of doing something because they could instead of because they should. Granted, the many heads of the hydra would have been difficult to animate through traditional methods, but it could have been done, and I think the result would have been more satisfying. In addition to the increased use of CGI, Hercules breaks from tradition in a few other ways. For one, it offers one of Disney's most "pop" soundtracks. The songs in Hercules tend toward a combination of gospel and R&B, with some Phil Spector tossed in as well. I can't say I'm wild about the tunes, but they work well for the tenor of the story, and the novelty of them - in this format, at least - makes them more refreshing. I also was rather fond of Susan Egan's performance as atypical romantic interest Megara. Unlike the usual dreamy-eyed Disney heroines, she's a rather bitter, cynical hard-edged babe, and although this aspect of the character seems - like much of the movie - forced at first, this personality grows on you upon repeated viewings. Hey, it's nice to see a little nasty in a gal every once in a while! I've now seen Hercules five times, and while it'll never be at the top of my personal hit parade, I must admit that I like it more and more every time I see it. It's a flawed film but it's a fun one, and that should count for something! 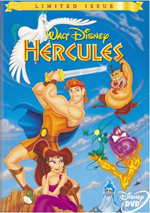 Hercules appears in an aspect ratio of approximately 1.66:1 on this single-sided, double-layered DVD; the image has not been enhanced for 16X9 televisions. A mix of good and bad left this as an erratic transfer. The biggest problems came from colors and dark shots. The various hues tended to be too dense, and they made details tough to discern. Look at the shots of the muses at the start; it’s very difficult to see any nuance in the art since everything’s so dark. Colors often could appear strong, but they were so often thick in this manner that they failed to display the expected vivacity. Blacks were pretty deep and firm, at least, but that didn’t compensate for the flawed shadow detail. Sharpness was surprisingly good for a non-anamorphic transfer. Wide shots came across as a bit soft and fuzzy, but much of the flick looked pretty distinctive and concise. I also noticed surprisingly few examples of shimmering or jagged edges, and only a few minor examples of edge haloes could be seen. Although the flick looked a bit grainy at times, it didn’t suffer from any other source concerns. This wasn’t a bad presentation, but its flaws left it as a “C+” presentation. I had few complaints about the Dolby Digital 5.1 mix of Hercules. It's a very active mix that presented wide and deep soundstage. The front imagery was broad and well-defined, and the rears also kicked in quite a lot of reinforcement. Ultimately, the entire package contributed to an engrossing soundtrack that contributed to the strength of the film. The quality of the audio was also solid. Dialogue appeared clear and natural, with no problems in regard to intelligibility. Although they occasionally lacked a little bass, the score and the songs seemed smooth and vibrant, while the effects made up for the missing low-end in the music. They packed some serious punch as they offered deep and strong impact to the mix. All in all, it's a pretty terrific soundtrack. Only a smattering of minor extras accompany the film. Of most interest is an unusually good nine and a half minute featurette about the film. Not surprisingly, this piece remains of a promotional bent, but it features an awful lot of interesting information for its short running time. 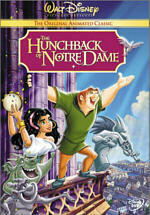 It includes comments from directors/producers/writers John Musker and Ron Clements, producer Alice Dewey, composer Alan Menken, supervising animators Nik Ranieri, Andreas Deja, Brian Ferguson, Ellen Woodbury and James Lopez, design consultant Gerald Scarfe, CGI supervisor Roger Gould, and actors Joshua Keaton, Tate Donovan, Susan Egan, Lillias White and James Woods. We get a quick overview of how the film was made, including the various processes and some looks at the voice actors at work. It's not much, but it's reasonably entertaining. In addition, we get a music video from Ricky Martin for "No Importa La Distancia". If you don't remember hearing that song during the film, that's because it wasn't there; it's a Spanish version of "Go the Distance", the movie's theme song. (I guess it appeared on Spanish dubs of Hercules, but it doesn't appear in the English version.) It's a turgid tune and a completely dull video. Music videos for movie songs tend to be lame in general - they usually just show the act lip-synching with a few looks at film clips as well - but those for Disney's films seem to be even worse than most. Hercules seems destined to end up as one of Disney’s semi-forgotten flicks. It’s definitely a lesser effort, but it presents a reasonable amount of fun and entertainment. The DVD provides very good audio but suffers from erratic visuals and very few extras. Though I like the movie, it’s tough to recommend this lackluster DVD, especially when it comes with a nearly $30 list price.